In Kids, Camila Batmanghelidjh is attempting two things. First, to put the record straight on what happened at Kids Company; and, second, to expose the massive failure of the state when it comes to protecting the most vulnerable children. On Kids Company, the founder of the charity makes the case that an organisation helping 36,000 children was closed down "malevolently and abruptly" because of the growing challenge it presented to the UK’s system of child protection. The problem, Batmanghelidjh claims, was that the government wasn’t, when push came to shove, willing to move to a different model of child protection, and Kids Company, with its growing client-base and escalating financial demands, became a thorn in its side. So, through a process of financial deprivation and reputational assassination, forces within government set Kids Company up to fail, despite unequivocal earlier support, numerous academic studies evidencing the effectiveness of the model and countless clean bills of health from government and private sector auditors. 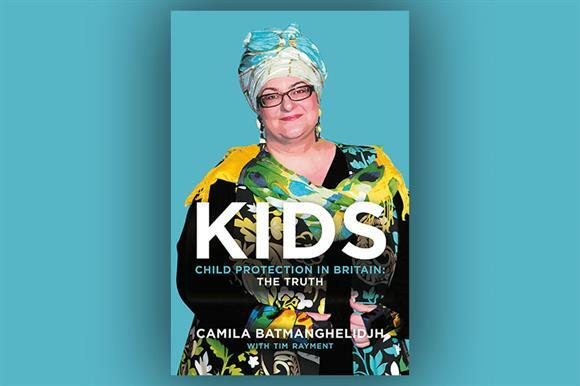 This well-researched, 400-page book is also serious attempt to challenge the accepted narrative on Kids Company as a shambolically run, spendthrift charity with few genuine clients and of Batmanghelidjh herself as some kind of strange maternal cult figure. Does it succeed? It certainly manages to weave a defensible story together using reliable information. There are touches here and there of conspiracy theory, but the strongest parts in defence of Kids Company sit in the accounts of meetings and communications between the charity and government over a period of years. The picture she paints is of a Conservative-led government that, having picked up Kids Company as a symbol of a new approach (the big society), comes to the view that that the challenge and potential cost of the model is too high, then back-tracks ruthlessly. One reason the book is so big is that much of it examines the problems with the UK system for child protection. Batmanghelidjh spares no details in explaining the visceral realities of the many children who are abandoned not only by their parents but also by the state. The system, she tells us, is broken, built around failures of the past and to which "great minds have never been truly applied". As a country, she says, we are in denial about this. She might be right. Her desire, on forming Kids Company, was to reinvent the child protection system based on the idea of love and support, and for this to become the adopted norm: "a Kids Company in every town". What angers Batmanghelidjh, and I empathise with this, is that the costs of such a vision are dwarfed by the state’s own failed initiatives, such as the £450m Troubled Families programme. Indeed, it was from Troubled Families that Batmanghelidjh demanded £20m to mainstream Kids Company’s work in London. This ended up whittled down to the £5m offer in 2015 that rendered the charity unable to carry on as a going concern. The book is most interesting for the insight it gives into Batmanghelidjh herself. An "outsider" – born into an elite Iranian family – she is also an unusual thinker, an entrepreneurial visionary whose world view is manifestly different from that of the mainstream charity chief executive. She acknowledges that people see her "more as a force than as a person". As a leader, I suspect she both inspired and confounded her top managers, some of whom went to the media with their grievances. Her emotional insight at times can be disarming, and she has the correct measure of many of the people who feature in the story. What I wasn’t always sure about was whether Batmanghelidjh always fully understood the position of other actors in the story. She is particularly tough on politicians and civil servants, who obviously felt constantly badgered by her. After a while, seeing no end to it, they clearly went into defensive mode, which signalled the beginning of the end for Kids Company. And, as Batmanghelidjh says herself, nobody does reputational assassination better than the British. If you read this expecting to find an apology, you’ll be disappointed. No, Batmanghelidjh isn’t taking the rap for Kids Company going down. Quite the opposite, in fact. She says that Kids Company was, by and large, pretty well run, had sound trustees and competent senior managers. She says she was ready to step down as chief executive as soon as the government agreed to put proper money in. She finishes the book by saying she regrets nothing. History might be kinder to Batmanghelidjh than the press she gets today. For now, her reputation is still on life support. Her book definitely goes a very long way towards countering the view that Kids Company was a shambles or, worse, a fraud, but it also underlines clearly that the trustees were never in full control of the organisation. I liked Kids more than I thought I would. I suspect you might too. Craig Dearden-Phillips is managing director of Stepping Out and convenor of Social Club, a network for third sector chief executives. Andy Hillier: So how can Batmanghelidjh be disqualified as a director?